In addition to increasing economic, environmental and technological challenges to business continuity, our highly connected world means more companies now manage risk across international operations, or supply chains and customer bases that span multiple, diverse regions. This makes it vital to recognise the nuances of communicating effectively across these different landscapes, and to understand the tools and strategies available for BCM activation and test exercises. 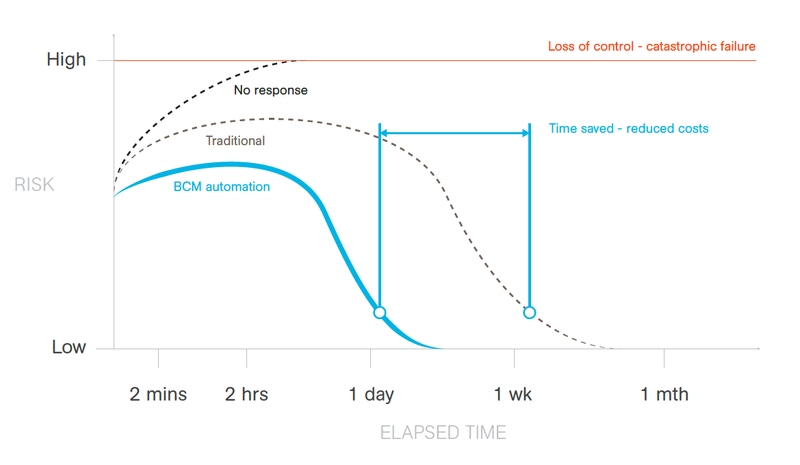 BCM Automation helps focus manual efforts on managing the exception or edge scenarios and business continuity outcomes, rather than managing the process. During a test, much of the manual effort is directed at receiving acknowledgement from those staff who have not been accounted for. During an activation, much of the manual effort is directed at activities that are not critical to the actual impacted site or business recovery, such as basic staff queries, customer relations, media updates etc. A 2015 Forrester study for the Disaster Recovery Journal shows that while the adoption of automated communication technologies has grown to 54 percent (up from 23% in 2010), a large percentage of organisations also continue to use a mix of highly manual communications modes. These include sending out corporate email (77 percent) and manual call tree lists (69 percent). The resulting workload means most organizations only test their BCPs once per year, with close to twothirds reporting never running an organisation-wide full simulation, leaving the business at risk of being unable to execute under the pressure of actual critical incidents or disasters. The choice of continuing with manual processes or advancing to BCM automation platforms can be charted as a trade-o between the likelihood and consequences of catastrophic failure, vs the system investment, as shown in Figure 1 below. Ostensibly, incidents always happen in at least one country, and only sometimes across a region, however central planning is often applied across all of an organisation’s spheres of operations. Local BCM ownership and empowerment allows country or business unit specific BCM processes to be applied, which are able to better cater to local market nuances. HQ-led BCM planning tends to drive one process and apply it equally to all regions, because this benefits consistency in documentation and ease of running the process, but often this does not benefit the outcome. This tends to be the case when BCM communications are not automated, as manual processes must be simplified and uniform throughout the organisation, whereas the most effective programs actually embrace diversity in processes...and that’s ok.
Moving to automation necessitates revisiting the thinking behind the process, creating the conditions for localised planning and ownership. Human intervention is also reduced, lowering the risk of error, and allowing incident and service work flows to be conceived and executed at scale. To maximise successful message delivery and recipient’s response, use the strengths of multiple communications channels – for instance, send an SMS+email+mobile+web message once to deliver content, while in parallel, send voice calls with autoretry for maximum disruption, until content is acknowledged. Bear in mind, BCM activations often entail disruption and repetition of contact, rather than observance of standard meeting etiquette. Inspire the required urgent action! Telco capability and government regulation differs considerably between neighbouring countries. Several factors can a ect the reliability of communications delivery, such as; SMS may be sent across many different routes during delivery to a handset, however, not all routes perform the same. Some paths will result in high delivery, while other routes can result in latency or even non-delivery. SMS may be reliable in some countries, while it may be filtered for content and blocked if originated internationally. Carriers apply various conditions which may limit message delivery, including regulatory, content and spam filters. Voice is largely very reliable internationally, however as a standalone channel has clear limitations in terms of content and point in time delivery. Leading BCM communication platforms allow cross-channel communications work ow to be con gured and have advanced geolocation and targeting capabilities to segment and target audiences by location, quickly and accurately. Consider integrating common social messaging and chat apps, or event building management systems into the BCM communications mix. Chat apps in particular have become an entrenched communication standard in many markets, often replacing traditional contact channels such as SMS or their users, and offer a fast, low cost initial method for reaching this audience. Many of these apps are relatively unknown outside of their core markets, but their reach is undeniable. WeChat, for example, reports over 600 million monthly active users, predominantly across Asia, while Kik Messenger is a growing force in the United States, with over 240 million registered users. Deploying a dedicated out of box organisation-wide mobile app for BCM communications provides a high probability of effective reach, with automatic escalation to traditional telco channels (eg SMS, mobile-web) where there is no initial response. For a large assemblage of contacts within a single location, publishing communications to building management systems, public announcement systems or digital sign-boards can be a powerful way to disseminate directives, when used in conjunction with individual targeted messages. Direct response from affected staff may not always be possible on the expected channel, for a range of reasons. Staff may be located in high density, and some will receive the communications before others. Or a staff member may not have a mobile device with them, but are in the company of someone who does, so provisions should be made to allow a colleague to account for them on their behalf. Allowing the use of secure inbound contact routes – mobile, web portal, text-in, or voice call-in will maximize speed and accessibility of staff acknowledgement. Messages can be sent in multiple ways that optimise the chances of delivery, including voice, SMS, Social Media, in-App, Rich Messages and email. Vital information can be delivered quickly and at scale, when needed, and in-field staff can respond accordingly – sharing updated information such as site reports or pictures of affected areas, for improved situational awareness. GPS-enabled smartphone applications allow users to share realtime location information, allowing BCM coordinators to communicate rapidly and reliably with people who require access to information, as an event unfolds. Mobile-web or in-App rich messages can be used to receive and run communications work ow. Preplanned conditional logic (eg if x and y and z, then A, for the next B hours) collapses multiple simple communications steps into one, relieving BCM coordinators of simplistic decision workload and instead, reserving this critical resource to focus on more nuanced observe-analyse-decide steps. One of the most disruptive issues to BCM coordinators is the requirement to keep up line stakeholders informed at any given moment, while also managing the unfolding incident response. 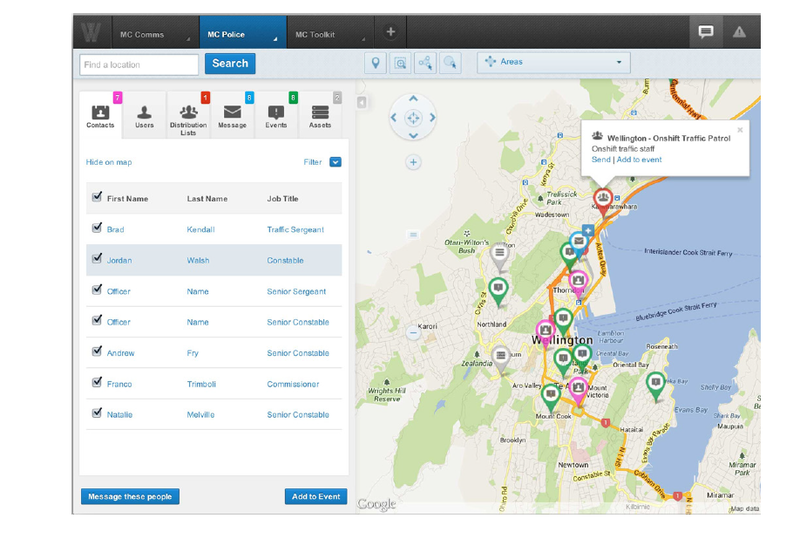 Mobile and web dashboards are features of quality incident management systems, and can be deployed with secure access for selected stakeholders. The event can be managed in real time, with timely information flows including executive dashboard views, analytics and reporting, as in Figure 4 below. Pre-planned communications with re-usable templates should be ready to publish to social media, company website, and other external media with pre-approved, timely content. Again, corporate communications should focus on external media exceptions, rather than the preparation and release of standard media holding statements, and other non-urgent responses. Best practice BCM programs are built around cross channel communications platforms, which provide interactive, responsive communications, comprehensive reporting and message delivery status transparency for key staff and senior stakeholders. Communications automation and work ow acceleration, combined with integrated monitoring systems, provide BCM leaders with a unique and powerful opportunity to advance their organisations resilience posture, while also streamlining day-to-day organisational communications processes.